Many organizations still rely on internal and external computer hard drives for storing and back-ups. But today, organizations have another option: the cloud. This service stores your data online, makes it accessible for your team, and easily allows you to share and send files. And more people are using the cloud for personal and business use. In 2018, 3.6 million web users used cloud services. Are you not convinced that you need to use the cloud? Here are 9 benefits of cloud storage. Since all of your data is digital and not on a piece of hard drive, you worry about little-to-no server maintenance. Servers aren't only expensive but they also require hefty maintenance fees. The cloud is affordable (and free for small data storage) and there are no added maintenance costs. This helps save your business time and money. You also save because you don't have to rely heavily on hiring in-house for maintenance. You can outsource an IT firm to make sure your platforms are performing well and your data is secured. This will also save your business money in the long-run. More businesses are switching to a remote environment. It's cheaper, increases productivity, and is flexible for both you and your employees. But what about your data? Since your data is stored digitally, you and your employees can access your data online - from anywhere in the world. Store your essential documents and projects on your cloud platform. You and your team can function as a group while working individually all over the world. Before the days of the cloud, sending files was a hassle. Because of the prevalence of remote and freelance work, transferring files is more essential today. But the cloud gives an easy method to send and share important files. Every cloud storage platform is different, but most give you the option to send data to another user on the system. You can also send data via email and through URL sharing. Sharing data is not only useful for group projects and collaboration. Sending files helps minimize data loss, especially if you and your team back-up your files. While reading this list, you're probably wondering about backing up your data. Fortunately, many cloud platforms offer data back-ups and other services that further protect your data. This helps prevent data loss. Bugs happen on the web, which puts your data at risk. But many businesses are also vulnerable to security breaches and ransomware, which targets your precious data. It's still recommended you store your data elsewhere, such as a separate external hard drive. But you can use the cloud to work in and save all business projects and documents. Gone are the days of scheduling in-person meetings with clients to discuss sales figures and other important information. Today, you can easily transfer files and contracts to clients. You and your clients have constant access to these files for both of your convenience. The cloud also provides a convenient platform for clients to comment on the data and ask questions. Every platform is different, but some enable commenting and messaging directly on the platform. Did you know cloud security is at its height right now? That's because cloud security is growing. Approximately 43% of hackers target small businesses because of their small data vulnerability. While the cloud has some vulnerabilities, large cloud storage corporations are cracking down on hackers and are increasing their cybersecurity efforts. For example, more cloud servers encrypt data, making it difficult for hackers to break in your account. It's still recommended you outsource an IT and cybersecurity firm so you can act on hackers when they first start to attack. Another cost-saving cloud benefit is scaling your services. In other words, you only pay what you need. You never have to worry about hidden charges or fees. In addition, you also don't worry about running out of space. If you exceed your storage, you simply upgrade your space allowance. This is beneficial for businesses of all sizes because the cloud offers cost-saving and flexibility benefits for all organization sizes. If a small business grows, they can upgrade their space. Many cloud services have higher space options for larger businesses that are more affordable than hosting servers and allow their customers to upgrade and even downgrade, depending on their contracts and services. No storage option is simpler than the cloud. All you need is a computer and the internet to upload and access your data. This eliminates needing expensive and complex hardware. You can downscale your staff because you no longer need professionals in-house to maintain your physical servers. All you need is to outsource an IT company to make sure your cloud storage is working properly and your data is protected. Because of this convenience, your business saves a lot of time. There's little chance of issues that disrupt your work. This ensures you have plenty of time to focus on your projects. The cloud also allows you to focus on the core aspects of your business or your job. You no longer have to worry about tedious tasks that servers bring. Let's take server updates as an example. A server update can take an extremely long time, whereas cloud updates are quick and usually automatic. There are many benefits of cloud storage. 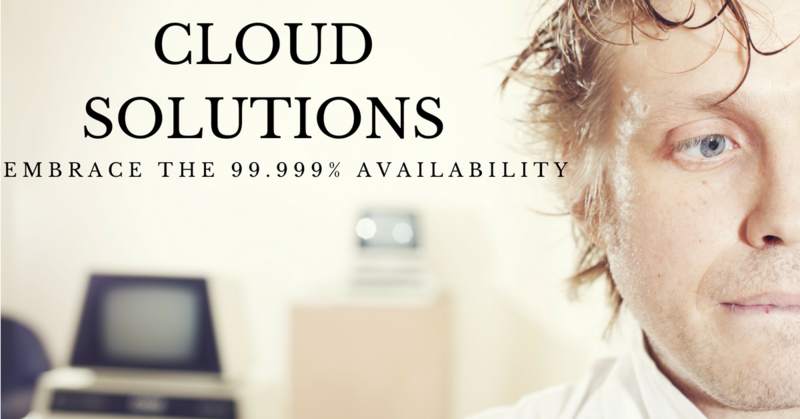 But you shouldn't switch to the cloud without an IT managed service provider at your side. The right IT team will ensure you'll never lose your data and you'll never become a victim of a data breach. Take a look at our services and see what we can do for your business.